The Eagles for Life group was thrilled to have a visit from Dr. Kalamarides of the Vitae Clinic today during lunch. Dr. K explained the development of the new baby through the use of ultrasound pictures. Then, as a special treat, the students were treated to a live sonogram demonstration performed on a pregnant volunteer! 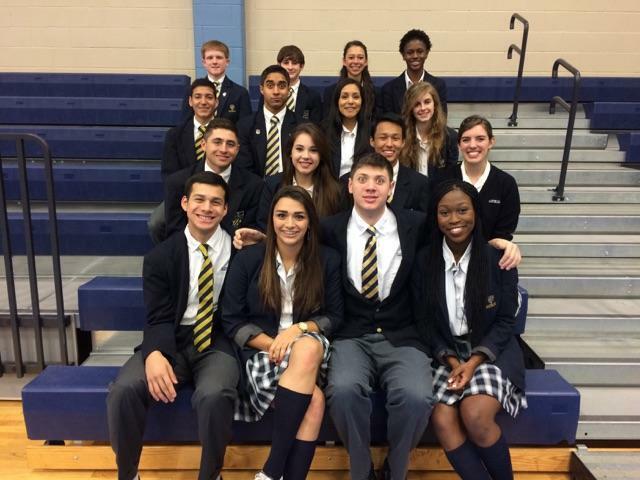 The Savio Music department participated in the TAPPS 4A music competitions last week. It was an intense and exciting week of music making for the entire music department! The students performed very well and presented themselves in a Christlike fashion throughout the week. Listed below is a synopsis of the final results for each sphere of music: string, instrumental, and vocal. State Runner-Up at this years TAPPS 4A Music Competitions!! Congratulations to all of our string and instrumental students who competed, they did an excellent job! Bravo!! We hope to see everyone for our final spring concert on May 15th, 2015 starting at 7:00pm in the SVdP Parish Activity Center. Thank you for your support of our Savio Music Department!! Eagles fans turned out strong to support the team in the Friday night contest at St. Michael's. On the mound, Schyler Hallberg pitched a solid six innings giving up four hits and striking out eight batters. Dominic Kress and Tony Aulfieri produced the two hits for the Eagles who left 5 runners on base in the 2-0 loss. Savio will play their third of six consecutive road games when the team travels to Waco to face Reicher on Monday evening. Fr. Rocky from Relevant Radio was at Savio to broadcast the "Go Ask Your Father" show LIVE on Tuesday, March 26. Our students asked great questions! If you missed it, you can listen to the podcast HERE. 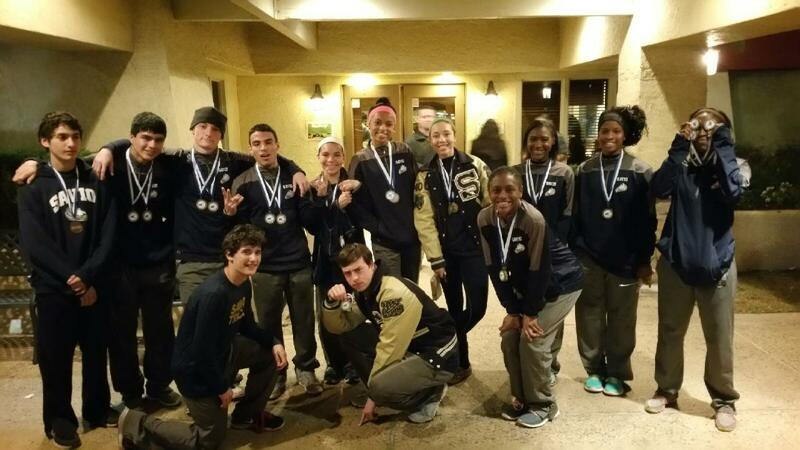 Savio Track and Field Athletes Compete Today at the World Famous Texas Relays!! 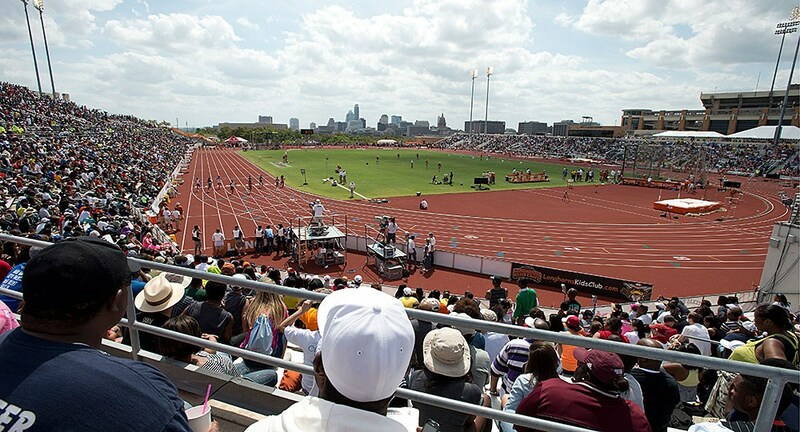 Twelve Savio Track and Field athletes will leave this Friday morning to be among the 5000 elite athletes from around the world selected to compete in the 88th running of the Nike Clyde Littlefield Texas Relays! They will share the stadium today with many Olympians, top-tier collegiate and professional athletes, and the high school track elite. It is a wonderful achievement for these individuals and a great day for Savio Track! Fans interested in attending the meet can visit HERE for tickets and information. Many more of our athletes gave very strong performances at this large meet but fell just short of the official top awards. Several personal records were bested, including some that are approaching new school records (and some that have already set new school records).....so stay tuned for updates to the record board! Family support was high despite the long drive to Dallas, and parents in the stands report a predictable buzz when our athletes take the track ("Who are these kids? What is Savio? Where are they from?") Our athletes were repeatedly congratulated by other competitors with questions like "wow, what was your split?" and comments like, "I just love to watch you run." Folks from all over Texas are certainly learning that the name St. Dominic Savio is synonymous with graceful competition and athletic excellence. Mrs. Heyl and Mr. Jameson accompanied a group of Seniors to Faith in Action Advocacy Day at the State Capitol building on Tuesday, March 24. The event was a unique and wonderful first-hand experience of the intersection of faith and political participation. Following an invocation by Cardinal DiNardo on the South Steps, Texas Bishops from El Paso to Beaumont to Brownsville addressed several hundred supporters on the Texas Catholic Conference's positions on upcoming legislative measures. Bishops took turns advocating Texan Catholic perspectives on end-of-life care, immigration, and education, among other topics. Students later attended a mock hearing on the subject of the death penalty in the Congressional auditorium, where they posed for an unannounced photo opportunity with the First Lady of Texas, Cecilia Abbott. Of the Advocacy Day experience, senior Thomas Hurlimann said, "I really enjoyed it. I didn't know the Catholic Church's perspective on a lot of these issues. For instance, I didn't realize it had a position on pay-day loans. It taught me a lot." Savio students will again be able to participate as concerned citizens and Catholics when Advocacy Day next occurs in 2017. Savio Chaplain Corps Hosts "In Jesus' Name We Play!" 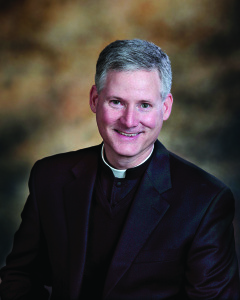 On Saturday, March 28, the Savio Chaplain Corps is hosting "In Jesus' Name We Play!". It is going to be a great day filled with fun and games. All children of elementary and middle-school ages are invited to experience fun drills and games with our Savio sports teams. We will also have a special visit from our robotics robots!!! There will be food for all and parents are invited too. It is completely free and from 11 am to 2pm. Fr. Rocky is Coming to Savio Thursday, Mar 26! Fr. Rocky, host of Relevant Radio's "Go Ask Your Father", will be coming to Savio Thursday, Mar 26, to broadcast his national program LIVE from our campus! Savio students will have the opportunity to pose questions about the Catholic Faith and much more during the hour long show beginning at 12:00 noon. Tune in to listen or stop by the gym, all are welcome! Savio Baseball lost the district opener 3-0 at Hyde Park Tuesday evening. Dominic Kress pitched a good game holding the Panthers to 1 unearned run through 5 innings and striking out 5. Daniel Zamora (2B), Marty Sedlacek (1B), and Tony Aufieri (1B) accounted for the three Savio hits. Savio's next game is at Regents on Friday (3/24) at 6:30. 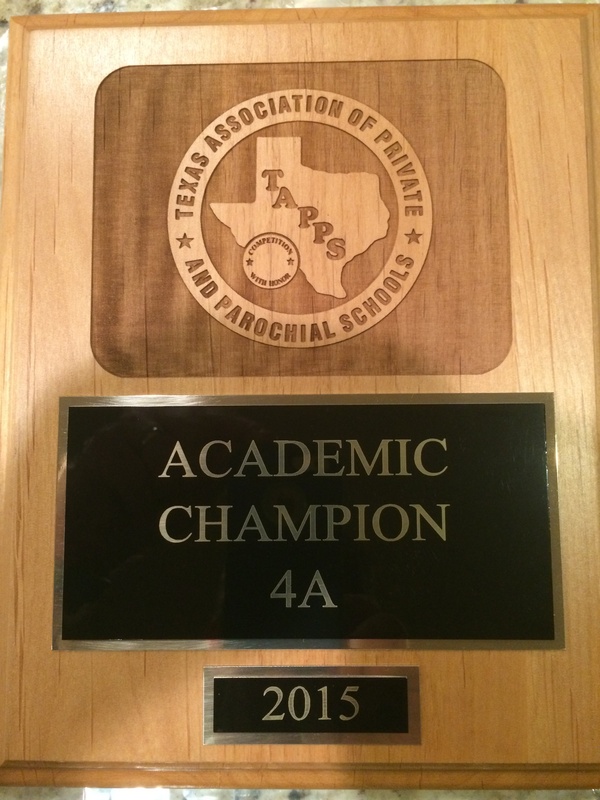 The Savio Academic team edged out 30 other teams for the title of State Academic Champion this week. Additionally, Savio won fourth place in overall sweepstakes. Savio's yearbook nabbed second place in state. Grace Isakson is the first Savio student to successfully defend a state championship in the science event. Savio Track Qualifies Three Relay Teams into the Prestigious Texas Relays!!! In the words of Head Coach Leonard Brantley, "It is a great day for Savio Track....a very GREAT DAY!" .....The announcement came just short of midnight this past Thursday night....while most of St. Dominic Savio's students were on Spring Break, the Track Team had been hard at work, attempting to do the unimaginable...qualify multiple relay teams into the world-famous, highly esteemed, Clyde Littlefield Texas Relays!! Our athletes put forth their best efforts against a field of Division II teams at the Cedar Ridge Qualifier on Saturday afternoon. Official times were snapped by the approved, Fully Automated Timing (FAT), photo-finish equipment...And, then the teams waited. 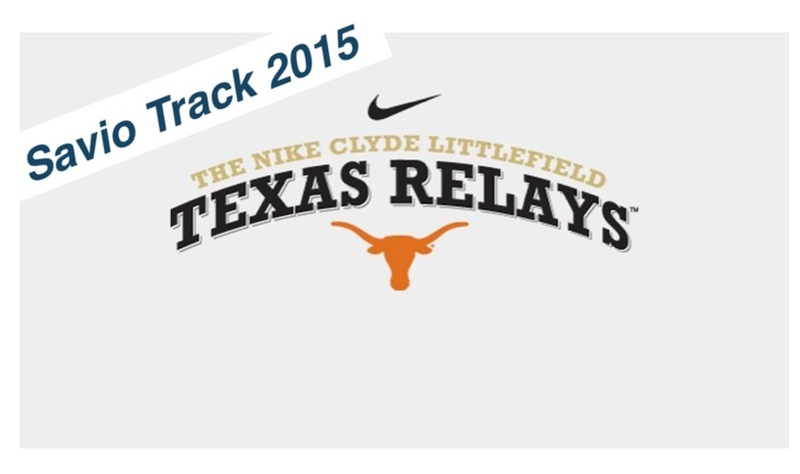 Twelve Savio Track athletes will be among the 5000 elite athletes from around the world selected to compete in the 88th running of the Nike Clyde Littlefield Texas Relays to be held March 27, 2015! They will share the stadium with Olympians, top-tier collegiate and professional athletes, and the high school elite. It will be... a GREAT DAY! Please come out and cheer these teams to the fastest races of their lives. 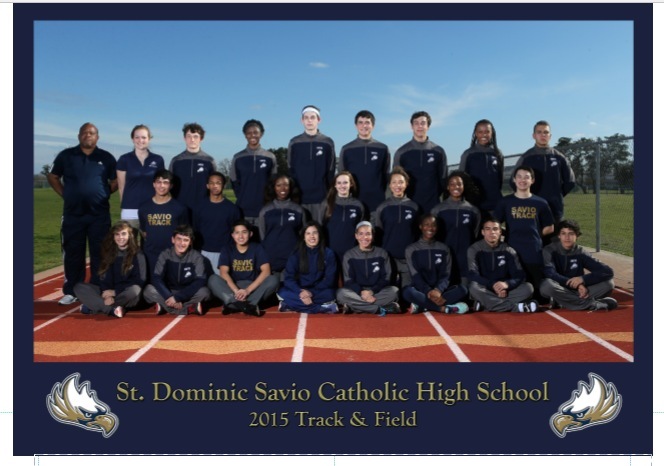 For Savio Track Fans unable to attend the event, your earnest prayers are appreciated. Please pray for the safety and fortitude of our runners, and, for our athletes and their families, pray this experience may fill their hearts with joy, strength, and gratitude. We are so very blessed! The weather was finally super for the Eagles and Lady Eagles golfers as the group of 8 Men and 5 Ladies were hosted at Grey Rock Golf Club by Regents High School. The sun was shining and the slight breeze made for a great day on the links. The Eagles played well and are finding their swings. 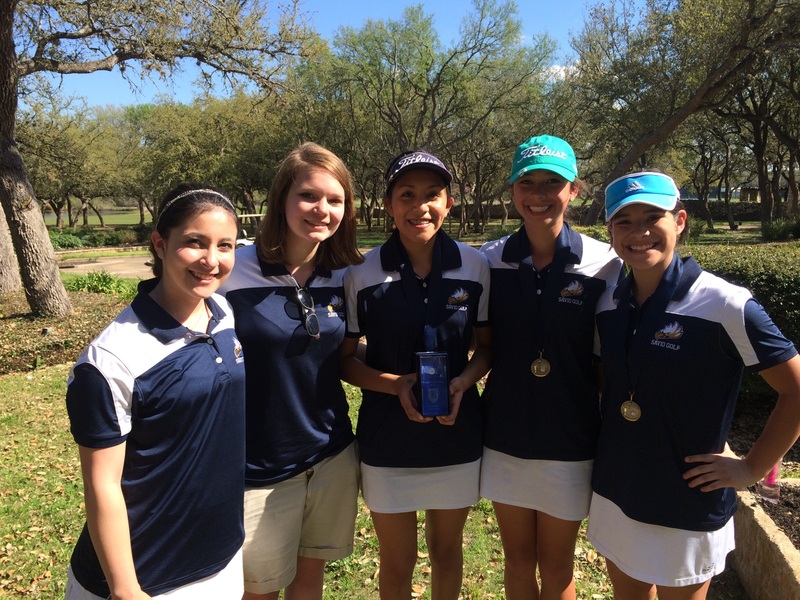 The Lady Eagles also played well and took 2nd place honors as a team and earned 3 individual medals. Overall, both Eagles and Lady Eagles had a great time and are looking forward to their remaining tournament season. The Savio Baseball team won two games against the Austin Royals on Thursday. Simon Scales pitched Savio to a 19-1 victory in the first game. Schyler Hallberg and Daniel Zamora both had 3 hits and 4 RBIs each. Dominic Kress and Mark Lacayo both went 2 for 3. In the second game, Savio batters had 17 hits in the 21-0 win. Tanner Martinez led the team going 4 for 4 with 2 doubles and 4 RBIs. Alex Warren and Schyler Hallberg both went 3 for 3 and Jacob Killburn went 3 for 4. On the mound, Hallberg picked up the win and had 7 strikeouts. Savio baseball is now 7-7 and starts district play on Tuesday 3/24 at Hyde Park. The Savio Baseball team went 1-1 this week as they took on Copperas Cove High School on Wednesday and Goldthwaite on Saturday. The Eagles lost a close game Wednesday night against Copperas Cove. It was a close game throughout, but a 7th inning run gave the Bulldawgs a 5-4 win. In his first outing of the year, Schyler Hallberg pitched well but the Eagles could not overcome from leaving 11 runners on base and committing 5 errors. The Eagles traveled to compete against Goldthwaite, scoring 2 runs in the top of the 7th inning for a 3-2 come from behind win on Saturday afternoon. Tony Aufieri went 2 for 3 and Schyler Hallberg notched the win. Dominic Kress pitched the bottom of the 7th to get the save. The Eagles play a double header Thursday (3/19) at St. Dominic Savio at noon and 3pm. Come out and show your support! Congratulations to the Eagle Boys basketball program as they completed a resounding, record-breaking year while moving to a higher-level than ever reached before! We have been blessed with a lot of good fortuned, combined with the hard work of our players over the past 12 months. A job well-done! Eagles Tennis Team Triumphs in Pre-District Tournament! The Savio boys and girls tennis teams earned astounding results at this year's pre-district tournament. Held March 6-7 at Hyde Park's tennis courts, the Eagles were one of four teams to compete, including St. Michael's, Hyde Park and Regents. Savio placed nine players on the victory podium by the tournament's conclusion. Anthony Vento, sophomore, won 2nd place in boy's singles while fellow Eagle Jacob Mink, senior, took 3rd place. Alison Meskill, junior, won 2nd place in girl's singles. In the boys doubles division, Zac Ortiz, senior, and Peter Spangler, junior, also won 2nd place, and teammates Calvin Nazareth, senior, and Nicky Butler, sophomore, took home 3rd place. Kendra Sherman and Michelle Dinh won consolation in girl's doubles. All the rewards of pre-district are products of the players hard work and improvement during this season's practices. Even on the cold, wet days, the Eagles tennis team has risen above conditions to prepare for competition. The players demonstrated strong mental toughness and physical dexterity to bring home many medals from the pre-district tournament. The season is far from over, next up the team sets its sights on the district tournament at the end of the month. **Varsity Girls Overall 3rd Place Winners!! **Varsity Boys Overall Finish 7th.....not bad for a partial team!! Stephen Hampton wins the "Fighting Purple Heart Award" for an outstanding effort/lean at the finish of the Varsity Boys 200m (8-9th Place tied time!!) that left remnants of Stephen across several feet of lanes 3 and 4. The Track Team wishes to send thanks to an excellent group of supportive parents for long hours of photography, incessant cheering, food, beverages, blankets, and more! You are the best! We joyfully anticipate the arrival of our remaining team members, absent due to their valiant run at a Basketball State Championship. Congratulations on an amazing season! We are so happy to have you join forces with us this week! Go Eagles! The Savio Jazz Combo performed blues and jazz music for the students and faculty at the Cathedral School of St. Mary today. Their students really enjoyed the music and everyone had a lot of fun, perhaps inspiring some to be future musical Savio Eagles. Monday, March 9th, is an A Day. Tuesday, March 10th, is a modified A Day with 60 minute classes, then Pi Day activities in the afternoon. Dismissal at 3:10. Fri, March 13th is an E Day and the last day of the quarter. Due to inclement weather, all Savio classes and events are cancelled for Thursday, March 5th. Congratulations to the Savio Yearbook staff! 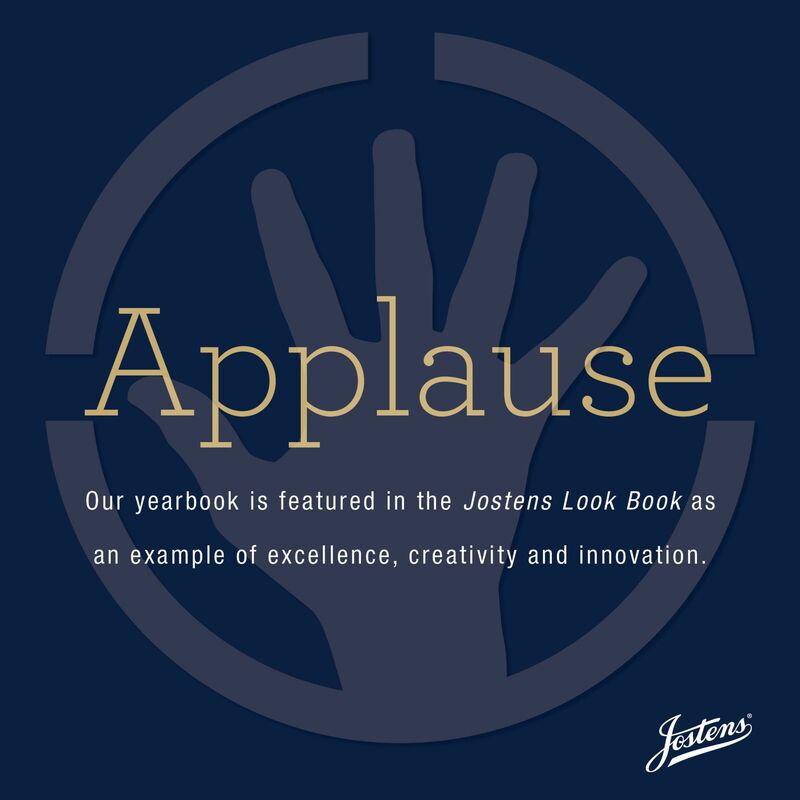 Pages from the 2014-2015 Yearbook have been selected to be included in Jostens Look Book that is sent out to over 15,000 schools to be used as ideas for their yearbooks. The Jostens Look Book is a collection of spreads and photos from outstanding yearbooks and their creative themes, cool covers, dazzling designs, relevant coverage, storytelling copy and action-packed photography. Along with design excellence, the annually published Look Book honors the important role well-crafted yearbooks play in helping schools chronicle the experiences, stories and achievements most relevant to students and that academic year. The Eagles have gone where no other Savio boys basketball team has gone! Savio won the South Regional tournament with victories over Laredo St. Augustine and powerful Houston 2nd Baptist in a come-from-behind overtime victory Saturday night. 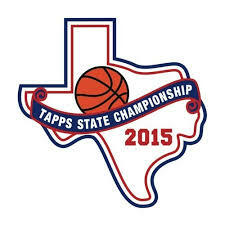 By way of their success, the Eagles will travel to the TAPPS AAAA State basketball tournament in Mansfield, Texas. They will open play against the defending state champion Westbury Christian at 9pm on Friday. Please make an effort to come and help the Eagles fly higher than they have ever before! On to state!